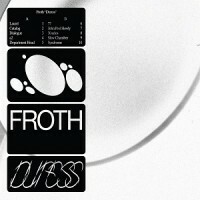 After a two-year hiatus, Los Angeles’ noise-rock trio Froth is back with their most fully realized work to date. A band of impeccable musicianship and an elevated sense of humor, the lead single is a twisted love song underlined with blown out guitars. “This song is about a guy who listened to the Yanny/Laurel thing and he can only hear Laurel,” shares the band. “He’s really passionate about Laurel being the correct pronunciation to the point where he will die before admitting otherwise. In the end, he reveals that he loves his girlfriend more than he loves the correct pronunciation of “Laurel/Yanny”. Froth has never been a band content with the status quo. After three records, scoring the Saint Laurent Men's Fall 2014 line fashion show (with frontman Joo Joo walking in the show), and forays into shoegaze, psychedelia and post-punk, the band of Joo-Joo Ashworth, Jeremy Katz and Cameron Allen have stepped outside the shadow of their influences and into something wholly their own. Co-produced with longtime friend and collaborator Tomas Dolas (Oh Sees/Mr. Elevator), the record is unapologetically experimental yet undeniably accessible. It’s an impressive and self-assured statement from a group only just entering their prime. With Duress, Froth has finally been able to realize their vision without compromise. Mirroring their open-minded studio approach, Froth’s live show is equally enthralling in its incorporation of analog synthesizers, overdubs and drum machines.